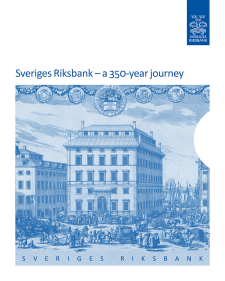 The publication “Sveriges Riksbank – a 350-year journey” was produced in conjunction with the Riksbank’s 350th anniversary and looks back at important events in the history of the Riksbank up to today's date. Who shall decide over the Riksbank? The author is Gunnar Wetterberg, historian and writer, and the main editor and co-author is Ann-Leena Mikiver, Director of Communication at the Riksbank.